Sometimes, I feel desperately fed up with the online world. I feel bored out of my mind. How often do you read on auto-pilot without absorbing any knowledge? How often do you skim texts, looking for interesting tidbits? And how often do you feel disappointed? I sometimes wonder whether we, as business writers, are doomed to bore each other to tears. At school, we’ve learned how to write. We learned about grammar and punctuation. But did we learn how to write well? Did we learn how to engage our readers? And how to be persuasive? If we want our messages to stick, we have to educate and entertain our readers. 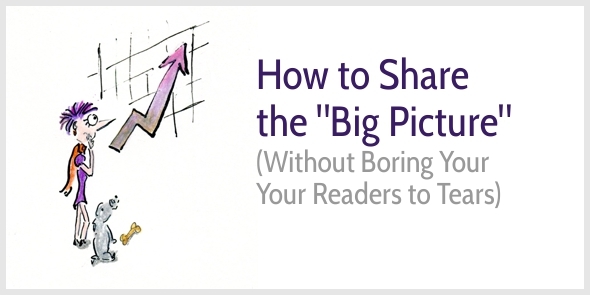 If we want to share our big ideas without boring our readers to tears, we have to mix abstract advice with concrete imagery. You haven’t learned that at school, have you? Me neither. At school, you might have learned that words are either abstract or concrete. A pear, a grape, a juicy pineapple—these are all concrete words because we can hold a pear in our hand, taste a grape, and smell a ripe pineapple; they’re tangible. In contrast, success, failure, and a mathematical equation are abstract concepts because we can’t touch failure, we can’t taste an equation, and we can’t smell success. These phrases don’t conjure up concrete images in our mind—unless we get more detailed information like: Henrietta tripped over her shoelaces, lost the contest, and cried like a baby; she felt like a failure. The distinction between abstract vs concrete may seem clear at first. Think about fruit. What image pops into your mind? You might think of the apples, pears and kiwis in your fruit bowl, or you might think of one juicy mango, or you might think of the fruit display at your supermarket or local greengrocer. When a word conjures up different images—a fruit bowl vs one juicy mango, then a word isn’t terribly concrete. Even a word like apple is still a tiny bit abstract, as you might conjure up a different image from me. You might think of the bruised apples your mother used for cooking your favorite apple sauce. Or perhaps you think of the zesty Granny Smith you had yesterday afternoon. I’m thinking of the Braeburn apple I had for breakfast with cinnamon, blueberries, almonds, and yogurt. 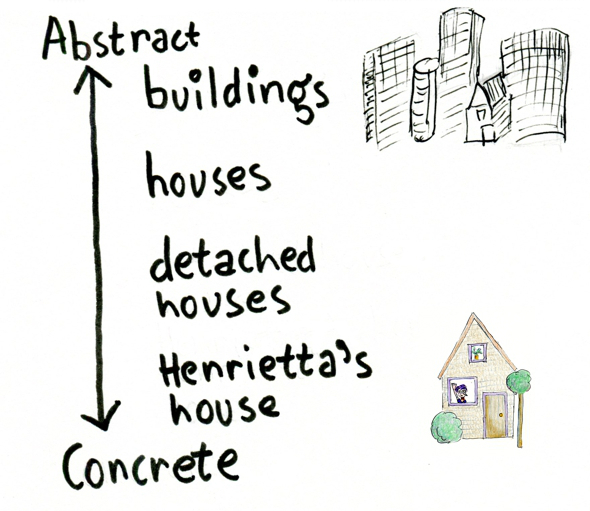 So, abstract and concrete aren’t discrete categories. They’re a gliding scale. The further you descend down the ladder, the easier it becomes to visualize your words, to imagine a specific scene. Many writers stay stuck at the top half of the ladder. They mix abstract language with somewhat concrete language, but they don’t become specific enough. But only when readers can picture a specific scene, your writing becomes engaging and colorful. Good journalists educate readers by mixing specific stories with abstract data and trends. Quamari Barnes, a 15-year-old student, had been stabbed several times. He fell just yards from the school gate. A woman cradled him in her arms as paramedics rushed to the scene before whisking Quamari away to hospital. By most accounts, Quamari danced to the beat of his own drum. As a precocious child, he held court in conversations with adults from an early age; by his teens, he could cook a full Sunday roast on his own. When he was younger, he had no problem being the only boy in his dance class; as a teenager, while his friends were into grime and rap, he went old-school – Bob Marley, Dennis Brown and Aswad. A Metropolitan police report released last month indicated that between 2014 and 2016 the number of children carrying knives in London schools rose by almost 50%, while the number of knife offences in London schools rose by 26%. 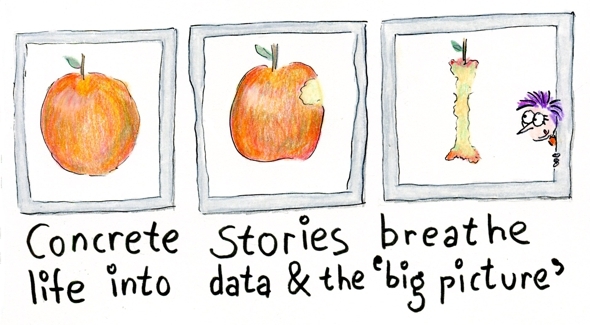 Together, the stories and data engage and educate. The data are cold facts outlining the big picture. The specific stories about specific people add emotion—they provide color to the hard data. They make the facts meaningful. [W]hat we get out of life is not determined by the good feelings we desire but by what bad feelings we’re willing and able to sustain to get us to those good feelings. To get readers to listen to our advice, we need to explain the abstract rules, and share concrete stories to add meaning. We sketch the big picture, and use examples to add color. A good journalist may narrate the story of one refugee family, before explaining the trends in people’s movements across the earth. A business coach illustrates online business models with real life stories. An architect shows photos or drawings of buildings to illustrate architectural trends. Trends, data, rules, models, lessons, and advice are all abstract pieces of information. They tell us the big picture. But the big picture only comes alive with specific examples and stories. Very interesting. I never considered writing or stories to sit on a scale of abstract to concrete. Or perhaps I just never considered it this way. I know I finally broke my silence with your last post (or the one before?) and complimented you on how amazing of a writer I think you are, so my next sentence is probably going to make me sound like either a nut bag or a creepy fan, but I think your writing is art. This is the thought that popped into my mind after I navigated your once again magical story. But then I pondered this a few more seconds and I thought, but no you’re also very clear in delivering and achieving what you set out to explain, so more mathematical. And then I decided that your writing is as beautiful as a simple, yet elegant math question and as adventurous and insightful as a beautiful piece of art. To me being both math and art is golden. What can I reply to such a lovely comment? Great story again Henneke! Thanks for sharing your knowledge with us time and again. This is an excellent post. It’s a step closer to understanding something I’ve been struggling to understand, this whole abstract VS concrete thing. To be honest, I didn’t know this is one of the issues I struggled with. I mean, I wouldn’t have been able to put it into words. That’s what makes this post good. You’re not the only one. This is where I see most writers go wrong, and they don’t realize exactly why their writing feels bland. Once you understand this dance between abstract and concrete ideas, you start seeing it in all good writing. I shall keep an eye open for the dance. A question to a fellow litty: what do you think of Ursula K. Le Guin’s The Lathe of Heaven? I recently read it. Lovely story, but her use of language is appalling. Am I the only one who thinks so? I can’t seem to find straight crit on her work. It’s disturbing. I’ve not read any of her work (I’m not really into SF). I purchased her book “Steering the Craft,” but haven’t read it yet. So, I can’t really comment. I’d say, trust your own judgment. A lot of writing is surprisingly poor. A Writer’s Coach sounds like a great read. And your drawings are fabulous! Yes, the Writer’s Coach is an excellent read. It’s a great book for grazing (like reading a chapter here or there when you feel like it). I don’t think it’s a book to read from cover to cover in one session of binge reading. Great post. Loved the stories and the examples. When you use examples like that, abstract vs concrete language does seem clearer. I didn’t fully understand it before but your examples helped me see the big picture of how each type of language works. I also loved how Jack Hart explained this in his book The Writer’s Coach. I knew about the importance of specificity and have written about it before. But this was the first time, I heard about the ladder of abstraction – I love it! A luminary once explained that, as we grow, we move from a state of unaware ignorance (we dont know that we dont know) through to a state of aware knowing. Henneke, you’ve just helped us writers to be aware of the abstraction ladder AND to know how to use it. Thank you indeed. Thank you for your lovely comment, Gary. This is an interesting concept, Henneke and I would like to study it better. If you want to know more, I recommend Jack Hart’s book “A Writer’s Coach” – chapter 9. Also, see how other writers you admire implement this idea; that’s one of the best ways to learn more and improve your writing (it’s what I continue to do to improve my writing). As usual, another thoughtful insight this will remain etched in my brain for a long time – probably forever. Thank you for your lovely comment, Bernice. Happy writing! When I first stepped into the blogosphere, the fact that was bewildering was the number of authors devoted on making you a better blogger. From tech lessons to how-to’s, there seemed to be few blogs with anything I wanted to read. Your clear thinking and analytical writing could be a master class in any University – this is not flattery. I am a retired professor myself. At the same time there is so much of you in every post that I can almost see you, your bycle and sketching pens,each time I start to read your writing. Abstract my mind picture maybe,but you have laid down more concrete facts than anyone I have read. It’s like hearing facts from a trusted friend whose way with words is magical. Combine that with your cartoons you are someone I know+ in my mind. I wish my days of teaching were still going. All my students would be using your posts as course material. Yes, I know what you’re saying about the bewildering blogosphere. I’ve felt the same, and still feel like that to some extent. I survive by focusing on getting the essentials right. Thank you for you lovely compliment on my writing. I love writing and sharing what I learn! I appreciate your stopping by, Nicolas. Thank you. There’s a new concept. Abstraction on a scale. Huh. Interesting! Does the author draw up complicated schemes of wheter you should match a 1/3 concrete with a 2/3 abstract word, for instance? What is exactly his point about subdividing abstract and concrete? Jack Hart doesn’t suggest a specific scheme or formula. I don’t think that exists. 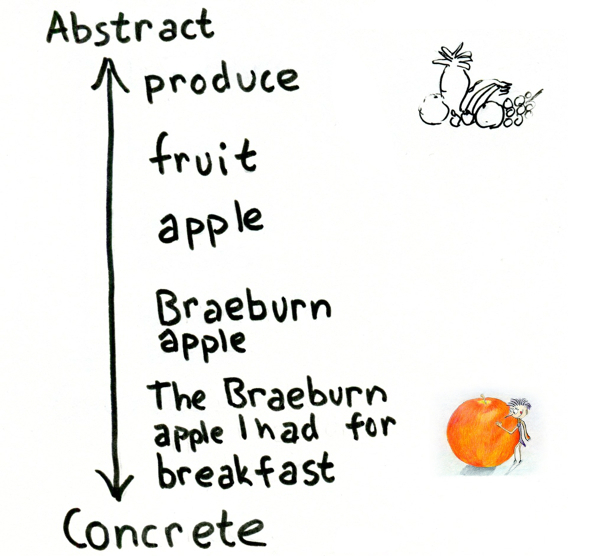 The point of the continuum of abstraction is to help people understand what it really means to use concrete language. Many writers think their writing is concrete, but their writing is only half-way the continuum. If they’re able to make their writing more concrete (or more specific), then their content becomes more engaging as readers can visualize their words. A second advantage is helping writers understand that abstract sentences aren’t wrong—as long as you mix the abstract statements with concrete examples so the writing feels alive rather than being just dry facts. I not only enjoyed your article but didn’t skim read at any point; so I guess you walked the talk. That’s because in the original text it wasn’t a capital because it wasn’t the start of the sentence. The full sentence was: “Therefore, what we get out of life is not determined by the good feelings we desire but by what bad feelings we’re willing and able to sustain to get us to those good feelings.” But the “Therefore” was confusing as a stand-alone sentence, so I eliminated it. I’m not sure whether different style guides have different preferences. I’ve seen both used. You’ve been reading Jack Hart! Yay 🙂 Isn’t ‘A Writer’s Coach’ terrific? I love the way with this ladder of abstraction concept he values both the abstract and the earthy. He wants writers to connect these poles together, to get them working with each other – rather than staying stuck in the boring middle. Yes, it’s a terrific book, and I so appreciate your recommendation! It’s probably one of the best (perhaps THE best) all round writing guide I’ve read. Fantastic post. This reminds me of my great high school English teacher. He would have us write a short essay almost everyday. His prompts would have us identify our topic to write about and then include “textual evidence” to back up our claims. This article reminded me of that. It sounds like you had a much better English teacher than I’ve had! Thank you for stopping by, Bobby. Excellent post! When I read your posts I feel like we are sitting together over coffee or tea. Thoroughly enchanting! Thanks! Like Ini I too would like to learn more of this concept. I’m not a writer just a budding entrepreneur who savours the art of good writing practise and who strives to do better at such. Your advice is always a worthwhile read Henneke and while ‘yes’ I’m guilty of skimming for tidbits I look forward to your posts my dear. Cheers sweetie…. I’d recommend Jack Hart’s book (A Writer’s Coach) – he discusses the ladder of abstraction in chapter 9. You may also find it useful to analyze how other writers use abstract vs concrete language – that’s what I do to keep improving my own writing. What a wonderful contemporary illustration of the use of Ladder of Abstraction! I originally discovered it in S.I. Hayakawa’s “Language In Thought And Action” (5th ed. 1990) and use it often in my daily life in general. Interestingly, Jack Hart also refers to that book – that’s where he first came across the Ladder of Abstraction. I’ve put it on my reading list. I’m looking forward to reading it! this is one reason I always look forward to receiving that email from you weekly, it’s always worth the wait. satisfying and sticking. this is yet another undeniably enchanting one. thanks for this one again. Henneke, I love this from your email intro. “To be honest, I’m not sure how many writing teachers really understand it. (Abstract/Concrete continuum) I definitely never learned about it at school. 🙂 Tis an irritation isn’t it? I got past it, more or less, when I decided the “master” teacher’s limitations left that much more for me to discover on my own. Kinda turned it into a treasure hunt for me. With your student’s quest, since of curiosity and imagination you have already done a wonderful job of organizing your treasure hunt and sharing it with the rest of us. I would submit this most recent post as exhibit “A”. The email page you sent was killer. It was impossible for me not to click through to the post. Impossible On with the treasure hunt. The best has yet to be found. Thank you, Curtis, I appreciate your encouragement! Love your drawings. The last one made me smile with delight. ? I still remember how you taught me during the course, to use examples and metaphors. You wouldn’t let me off the hook before the scene became vivid with details. That was a great lesson. And your article reminded me of it. But not only. Thank you for bringing the subject of the abstract and concrete writing to us so clearly and artistically. Thank you for your lovely comment, Irina. Happy writing! But getting that mix of facts intertwined with stories is a great way to keep readers engaged with our posts. I loved your examples and illustrations in this post, just been saving them to Pinterest. I’m pretty sure you’ll enjoy that book, David! Thank you for stopping by and for spreading the word. Fascinating! I certainly didn’t learn how to write well at school and had never heard of abstract and concrete words until now. So thank you, Henneke for another great post 🙂 and thank you for the recommendation, will check it out. Along with the concepts you explained, the article that Gary wrote was also pretty nice. From the way you explained it, I can definitely understand why it was so effective — something that might have taken me a bit longer to realise if it weren’t for you! I agree with you – that article by Gary Younge is well written, and it’s interesting to see how he keeps jumping up and down the Ladder of Abstraction to mix concrete stories with the data and the trends. My posts always do better if I begin with a juicy story. You are so right! Why can’t I remember that when I’m writing!? I bet you have more than enough juicy stories to tell! As usual, you don’t disappoint! Your idea on abstract vs concrete is interesting, I’ve actually never thought about the distinction between the two but now that I think about it, I can wholeheartedly agree with you — they are indeed very distinct from one another. I tend to be stuck in the top half of the ladder for most of my writing but hopefully now that i’ve learnt a bit more about abstract and concrete, I can maybe switch between the top half and bottom half of the ladder more often! Anyways before I end up writing an entire essay, lemme just end it there! Thank you so much for sharing this with all of us Henneke, i’m super duper excited for more content from you! Most people remain stuck at the top half of the ladder, but the most interesting content combines the very top with the very bottom of the ladder; it mixes the super-concrete with the really abstract. That’s a good point about gobbledygook because gobbledygook is usually somewhere in the middle of the ladder. It’s not super abstract and it’s not really specific. Usually content gets better if we replace gobbledygook by super-concrete details. > And what it took me a long time to discover is that I didn’t like to climb much. I just liked to imagine the top. That’s something I’ve come to realise lately, the difference between thinking that you want something, and actually wanting it so much so that you’ll put in the hard work to go and achieve it. Did you click through to read Mark Manson’s article? I really his perspective on this, too. Thank you for stopping by, Matthew. Loved this post! The abstract ladder really got me thinking and when I saw the mix of concrete and abstract to deliver interesting content, it was another light bulb moment. Thanks for the consistently inspiring and enriching posts, Henneke. I think last two lines is the summary of the post, love the style. last year i have taken a course from Coursera and learned the strategies of writing an introduction paragraph and I loved those strategies. Among those strategies, two were writing through storytelling and writing with interesting statistics. I think your post will help me to combine those and to write an engaging introduction for my reader. Yes, using stats and storytelling are both powerful strategies; and the real magic happens when you combine the two. Thank you for stopping by to comment, Hasan. I appreciate it. Oh, my goodness, Henneke! Your website is a giant maze of information and I can’t get out, lol. I keep clicking on the next link to see what else is around the corner :). But I am so glad I got stuck here :D. Thank you for sharing! Thank you so much for your lovely comment, Lena. Happy writing! Many thanks for this post! I was so enchanted I just purchased a copy of your “Blog to win business” from Amazon. I’m hoping it will improve my own monthly blog posts. Thank you, Peter. I hope you’ll enjoy the book. Let me know?